That snide lead by Margaret Talbot to her New Yorker article June 8 titled “Are Evangelical Leaders Saving Scott Pruitt’s Job?” should tip off even the uninitiated that what follows will be—shall we say, something less than journalistic fairness? First, that as the first EPA Administrator to enter office facing multiple death threats, Pruitt certainly qualifies for the security detail. The security detail, in turn, requires the first-class flights. And the other matters—including, which she doesn’t mention, an apartment rental alleged to be at below-market prices but found to be about average for the single room it covered? They’re at worst poor optics but don’t appear to violate ethics rules or indicate conflict of interest. But Talbot spews her real vitriol against the evangelicals who support Pruitt. She briefly mentions Franklin Graham, Jerry Falwell Jr., and Liberty University students, but she focuses on two: Ralph Drollinger, of Capitol Ministries, which provides Bible studies and prayer groups for government workers in Washington and counts members of Congress and the Administration among those who attend, and the Cornwall Alliance for the Stewardship of Creation, the ministry I lead. That the consensus is bogus. Oh, yes, an overwhelming majority of climate scientists—and probably all scientists, for that matter—think global average temperature has increased significantly since about 1850 and that human emissions of carbon dioxide and other “greenhouse” gases have probably contributed to that warming. Is CO2 the primary cause of the warming, or have natural cycles of the Sun and ocean currents dominated, as a climate statistician and two climate scientists have argued? Do the benefits of the warming outweigh the risks, or vice versa? Is the warming now or likely to become catastrophic? Do the risks from warming outweigh the benefits of the energy from the fossil fuels that release the CO2—and the fertilizing effect of added CO2 on all the world’s plants, including food crops? Would the benefits of a rapid replacement of fossil fuels with wind, solar, and other “renewables” outweigh the costs, or vice versa? Google “robust and self-regulating” and restrict the search to site:cornwallalliance.org. You’ll find that quoted phrase here and here. You’ll find a similar phrase, “robust, resilient, and self-regulating,” here, here, and here. And you’ll find the phrase “God’s wise design” here, here, here, and a few other places. But nowhere will you find us saying God’s wise design “will correct the damage we do” to the Earth. “It plays off the term ‘holocaust denier’,” which “cheapens the term ‘denier’ in a way that is painful to many in the Jewish community.” But, who knows, maybe anti-Semitism explains Talbot’s tone deafness? 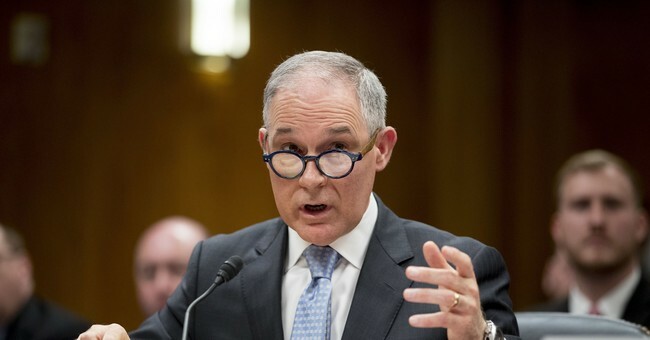 Pruitt echoes much of this thinking—he speaks frequently about “stewardship” and “management” of the resources that “God has blessed us with” and clearly wants us to use, and of following the “Biblical world view” on environmental matters.